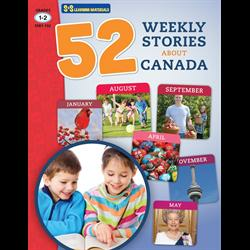 The 52 stories in this book have been designed to familiarize and develop student awareness of Canadian symbols, animals, birds, seasons, month of the year, special celebrations, famous places, and famous people. Each topic contains an information story and a follow-up exercise designed to review and develop strong reading and phonetic skills. The material in this book can be used in a variety of ways.